NEW YORK�(CNNMoney) -- U.S. stocks were set to open higher Monday, as investors welcomed a spate of corporate mergers ahead of President Obama's speech at the Chamber of Commerce. Dow Jones industrial average (INDU), S&P 500 (SPX) and Nasdaq (COMP) futures were all higher ahead of the opening bell. Futures measure current index values against perceived future performance. Stocks closed a choppy session on Friday higher -- ending the week with gains of more than 2% -- as investors looked past a muddy report on the U.S. job market. For the week, the Dow gained nearly 2.3%; while the S&P 500 was up 2.7%. The Nasdaq added more than 3% over the last five trading days. "We had some M&A news today and stocks abroad are looking good," said Peter Cardillo, chief market economist at Avalon Partners. He added that "the steady dollar and higher commodity prices once again are looking to take the market higher." In addition, he said corporate earnings and sales have been better than expected, with many companies raising quarterly dividends and announcing plans to buy back shares. "These are all bullish factors that are supporting the stock market," said Cardillo. While he said there will eventually be a pullback, "the fundamentals still point to green lights on Wall Street." Economy: President Obama will speak to more than 200 members of the U.S. Chamber of Commerce Monday at 11:30 a.m. ET. The speech will be delivered to some of the most influential players in Washington, and is seen as another sign of the thawing relationship between the administration and business community. Later Monday, a government report is expected to show that consumer credit rose a seasonally adjusted $2.5 billion in December, after increasing by $1.3 billion the previous month. Companies: AOL (AOL) agreed to purchase news blog service The Huffington Post for $315 million, the two entities announced early Monday. Shares of AOL rose nearly 5% in pre-market trading. Ensco (ESV) announced plans to buy rival offshore drilling company Pride International (PDE) in a cash-and-stock deal valued at $41.60 per share, which represents a 21% premium to Pride's closing price on Friday, the companies said. Shares of Houston-based Pride (PDE) surged 13% before the opening bell. Medical device maker Danaher Corp. (DHR, Fortune 500) will buy Beckman Coulter (BEC) for $6.8 billion, or $83.50 per share, the companies said. Beckman shares jumped 10% in pre-market trading. Humana (HUM, Fortune 500) was down 3% after the health benefits provider reported fourth-quarter earnings that missed analysts' expectations. The company said it earned 63 cents per share, versus a forecast of 81 cents. Shares of Hasbro (HAS) were down 4% after the toymaker said fourth-quarter earnings fell to 99 cents per share from $1.09 a year ago. U.S.-listed shares of Nokia (NOK) were up over 2% in pre-market trading following reports that a management shake-up is brewing at the Finnish cellphone company. World markets: European stocks were higher in morning trading. Britain's FTSE 100 ticked up 0.7%, the DAX in Germany rose 0.8% and France's CAC 40 gained 1%. In Asia, Japan's Nikkei ended nearly 0.5% higher, while the Hang Seng in Hong Kong slipped 1.5%. Shanghai remained closed for lunar new year celebrations. Currencies and commodities: The dollar fell against the euro and the British pound, but rose versus the Japanese yen. Oil for March delivery fell 44 cents to $88.60 a barrel. Gold futures for April delivery rose $2.70 to $1,351.80 an ounce. Three-month copper futures hit $10,160 per ton on the London Metal Exchange, a new record high. 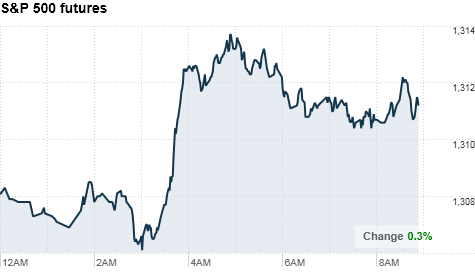 Bonds: The price on the benchmark 10-year U.S. Treasury fell, pushing the yield up to 3.67% from 3.58% late Friday.